As a child, Ian never believed in ghosts, goblins, spirits or deities and for years thought he was the only one. As an adult, he found a community of like-minded people who, rather than dismissing a belief or accepting it without question, asked for evidence. Ian holds a Bachelors degree in Computer Science from the University of California, Riverside, and works as a software developer in Olympia Washington. He prides himself on collecting a wide array of media (from Carl Sagan’s Cosmos to Santa vs. the Martians), loves video games, and is always training for his next, most challenging marathon. If Ian’s not recording, editing and producing Oh No, Ross and Carrie!, you might find him taking photos, attending lectures, or trying to get eight hours of sleep. 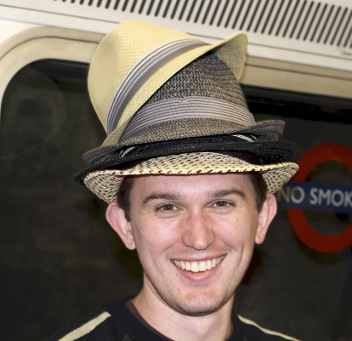 As you can see, Ian wears many hats. No, seriously… he wears many hats.